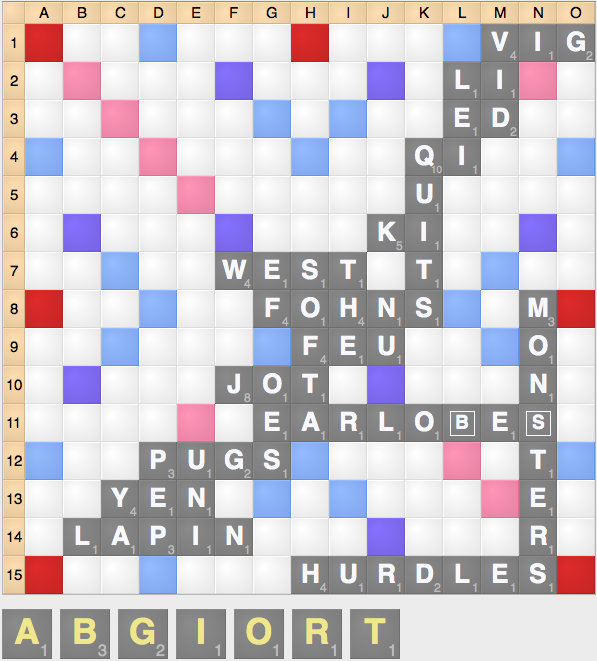 To win at Scrabble, you need to score more points than your opponent. Thus, for many players, it is counterintuitive to sacrifice points for any reason. 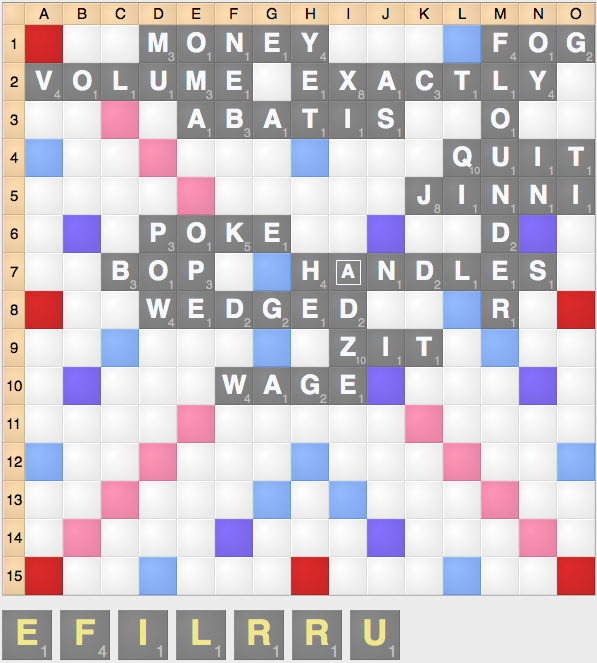 However, if you want to be a successful Scrabble player, there are many situations where it is worthwhile to sacrifice points to further your chances of winning the game. The first reason to sacrifice points is when doing so will help you score more points later on by preserving a good leave. Keeping a bingo-prone leave or avoiding a bad rack is essential: while you are sacrificing points now, you’ll usually make up those points (and then some) on future turns. 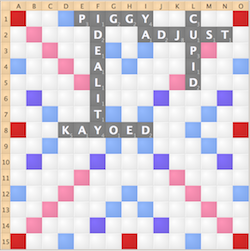 In Diagram 1, you are better off playing OUTLOOK for 22 points and clearing up your rack instead of playing JOTA k2 for 34 points, keeping a very-bad LOOU leave. In Diagram 2, you are better off playing VEND g11 for 9 measly points, keeping a powerful ENST leave. 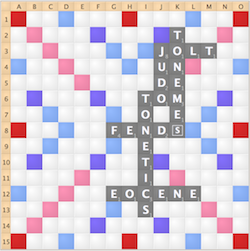 Although plays like VEST n1 or VENDS 13c score much better, the ENST is very likely to score well or form a bingo next turn. The second reason to sacrifice point is to prevent your opponent from scoring. Since the goal is to score more points than your opponent, plays that prevent your opponent from scoring is worth just as much as scoring more points on your own. 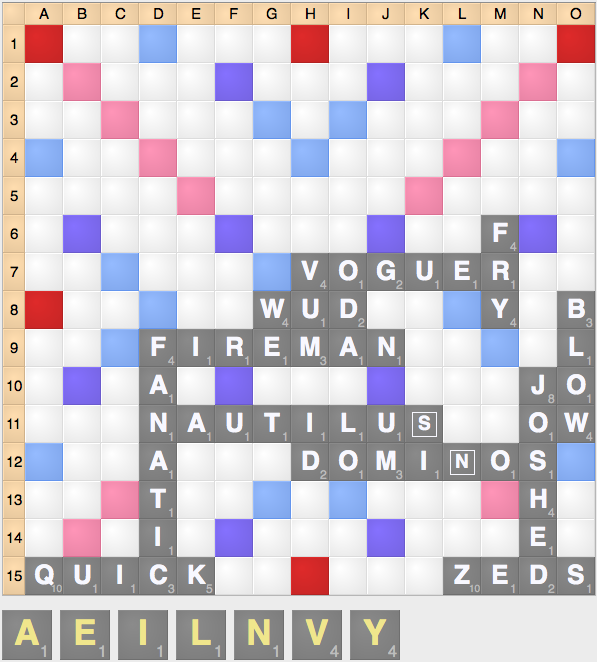 Blocking lucrative scoring spots and bingo lines is another good reason to sacrifice points. In Diagram 3, you should play VIE k4 (18). VIE blocks the last good bingo options on the board, blocking both the scoring spot and bingo line. While plays like VISIT 15k score far better and still keep a good leave, it allows your opponent to come back if they have good tiles. In Diagram 4, you should play DRIFT j6 (25), creating a right angle to block the top right quadrant. This allows you to block down the board, making bingos more difficult in both the short and long term and makes it easier to maintain your lead. 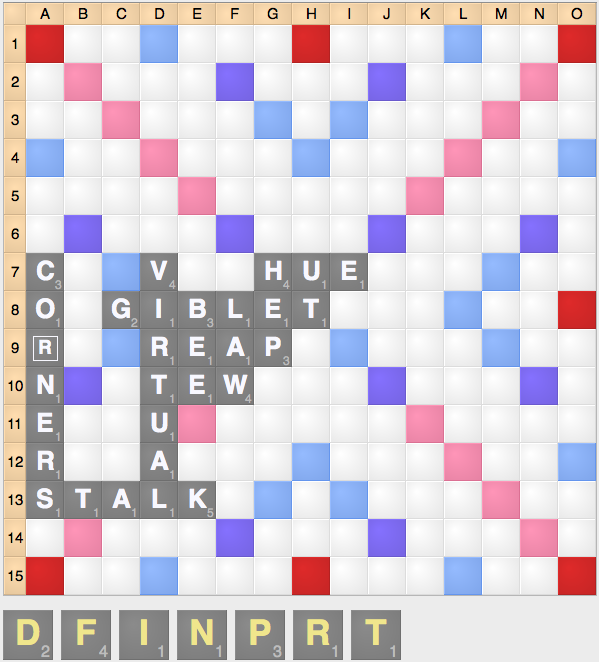 In Diagram 5, you should play BIOTA, as it blocks the biggest scoring threat on the board. 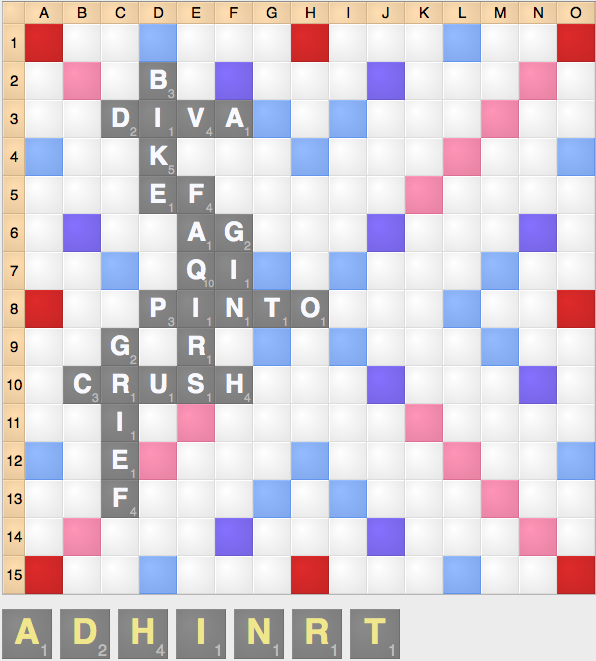 Even though BIGOT scores 7 more points and keeps a better leave, column o is such a strong scoring spot relative to the rest of the board that it’s definitely worth sacrificing the points to block it. 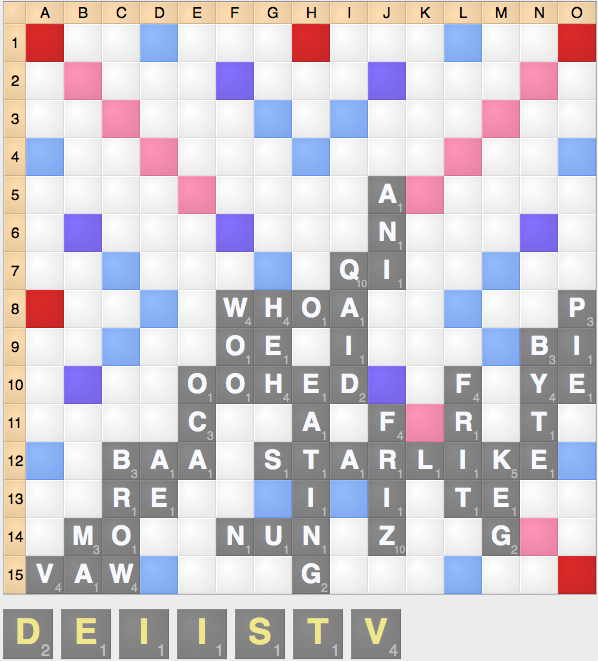 In Diagram 6, your opponent’s last play was DIVA, often indicating that they are holding a Z. Because of this, you are probably best off playing HIND, blocking the 60+ point Z play. When your opponent makes a play that is probably a setup, it is worth sacrificing a few points to inhibit your opponent from a high-scoring play on their next turn. The third reason is to help manage risk. When ahead or behind, it is important to manage the volatility (or entropy) of the board: sometimes you need to protect your lead or start gambling when you are behind. In Diagram 7, you should play QUICKLY, as it blocks high scoring extensions to QUICK, such as QUICKENS, QUICKEST, or QUICKSAND. Although they likely don’t have these extensions, it’s not worth the risk of allowing these high scoring plays to stay open. In Diagram 8, you’re well ahead, and the most likely way for you to lose is if your opponent uses the V in column 1 for a TWS/TWS play. Even though this is quite unlikely, it is the biggest threat and it’s not worth taking the risk of letting this spot stay open. Thus, you’re best off playing EVIL a1 (24) to block the opponent’s best path to a comeback. The final reason is a concept that I call point spacing. At certain scores and at certain durations of the game, scoring points becomes secondary to the other factors, and becomes far less important. Even though it’s always better to score more points, in certain circumstances other factors are more important.